As much of my work is in country gardens around Hampshire, Surrey & Sussex, I often need to find ways to blend the plants inside the garden with those in the wider landscape beyond the garden boundaries. There are a number of plants which I use for that purpose, and also where the planting needs to transition from cultivated flower beds to a wilder look in the further reaches of a garden, where wildflowers such as daisies and cow parsley may be growing for example. With millions of people watching Country File on the TV every week, there’s no doubt that an awful lot of us hanker after the Great Outdoors and yearn for a touch of countryside in our lives, so even if you have a small suburban plot by choosing the right plants to put in it you can bring a flavour of country life into your own garden. 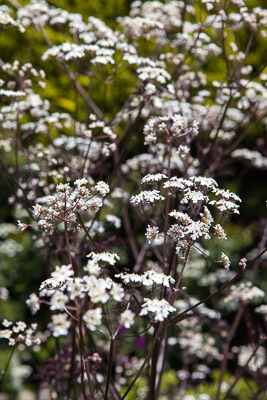 You can’t get much more ‘relaxed country look’ than Anthriscus sylvestris ‘Ravenswing’. Romantic as the name sounds, this is in fact a rather more sophisticated and elegant form of the very familiar cow parsley. 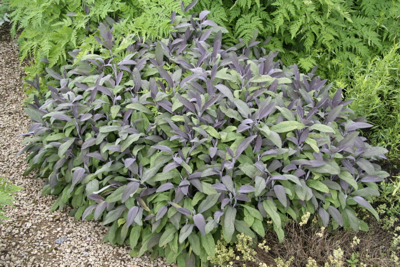 The difference is in the foliage, still deeply cut and lacy but a wonderful deep purple/black in colour that perfectly offsets the umbels of delicate creamy white flowers appearing from May to July. 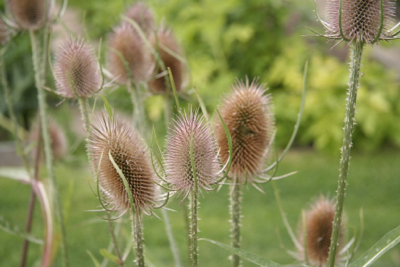 Rising to a height of 1m, but with a dainty spread of just 30cm and happy in sun or partial shade, this short-lived perennial or biennial will self-seed freely and makes a perfect companion for ornamental grasses in less formal or meadow areas of the garden. 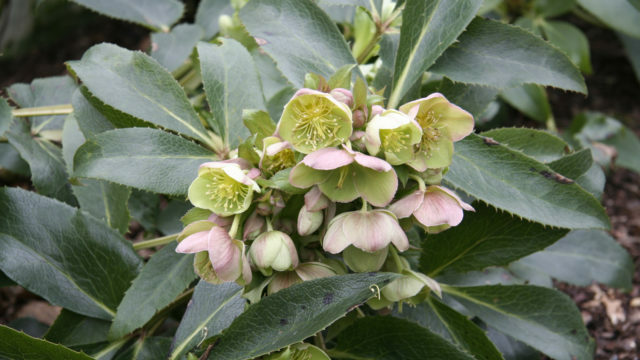 Fully hardy and prefers well drained soil. 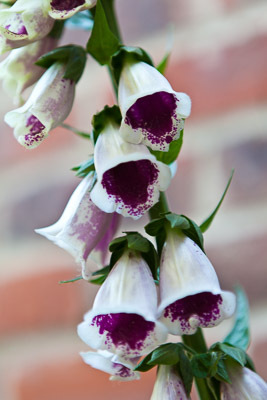 Foxgloves are a wonderful addition to natural planting schemes, providing vertical interest and self-seeding freely. And bees love them too! Digitalis ‘Pam’s Choice’ is a particularly attractive form, its nodding white trumpets of flowers heavily dotted and splashed inside with deep maroon. The flowers last from May to July on stems that reach 1.5m high and the basal rosettes of soft green leaves spread to about 45cm. They like a moist, humus rich soil and full sun to partial shade, but don’t worry too much about positioning – once you have them in the garden, one of the joys of foxgloves is watching them pop up each season where they know they’ll be happy. Leucanthemum x superbum ‘TE Killin’ has been awarded the RHS Award of Garden Merit for consistent and reliable flowers of great beauty. 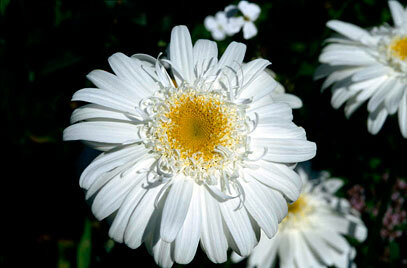 The large, white, semi-double, daisy-like flowers have golden yellow centres and are held on sturdy stems with dark green leaves from July to August. 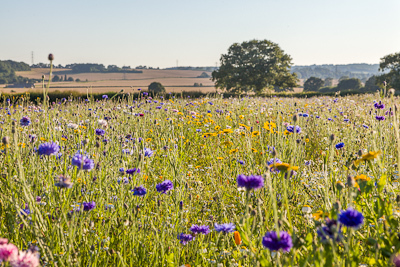 With a height and spread of 80cm x 60cm this makes an excellent mid-border plant and gives a relaxed, meadow-like feel to any summer border, looking especially effective when planted in large drifts. 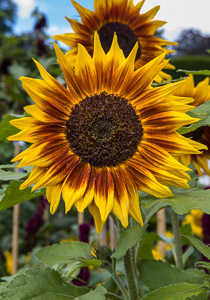 An easy-to-care-for, free flowering and fully hardy perennial happy on any reasonably moist and fertile soil in full sun or partial shade. Viburnum Opulus ‘Roseum’ (also known as ‘Sterile’ which doesn’t sound half as nice!) 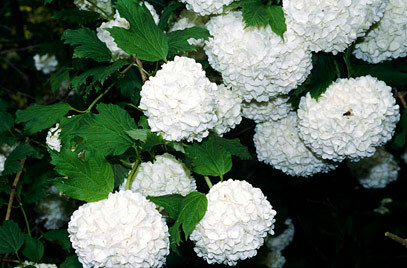 is a beautiful large shrub which is covered with snowball-like white flowers in May and June. Berries follow the flowers and later in the year, the fresh green leaves turn a beautiful purple-red colour before dropping. This is not a fussy plant, thriving in sun or some shade, and any reasonably fertile soil – just give it plenty of room as it could potentially reach a height and spread of up to 4 metres. 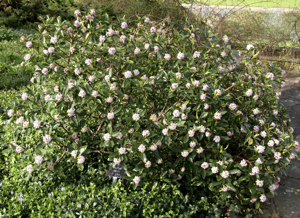 A smaller variety of this plant is Viburnum Opulus compactum, at approximately 1.5m height and spread – making it a much more manageable shrub for a smaller garden. Viburnum Opulus (commonly known as ‘Guelder Rose’ even though it isn’t a rose!) is often used in native mixed hedges and is a magnet for wildlife as well as being hardy enough to cope with exposed positions. Everyone loves honeysuckle don’t they?! 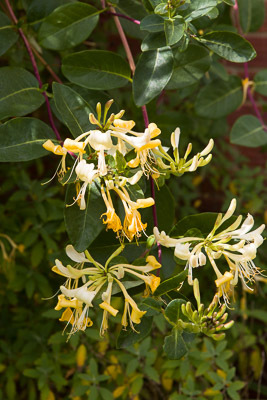 I do anyway, and Lonicera periclymenum ‘Graham Thomas’ is a climber I plant regularly when I don’t need something neat and well-behaved! This is ideal to plant on a large pergola structure or to scramble over walls or through trees. The flowers are a pale creamy yellow and are at their most fragrant on a warm summer evening. This is a vigorous twining plant and it will get up to 6 or 7 metres high, so it needs a lot of space as well as sturdy support. It’s an easy plant to grow, tolerating most soil types plus some shade, (although it’s at its best in a sunny position for maximum fragrance). It’s also a valuable plant for wildlife with nectar and berries attracting bees, butterflies and birds. Other plants which I like to use for the country look include the ornamental grass Deschampsia ‘Goldtau’, the brilliant red poppy Papaver ‘Beauty of Livermere’, Crataegus monogyna (Hawthorn) and the wild rose, Rosa rugosa.